The October 27, 1905 issue of the Kinston Free Press published a sketch and plans for a new train depot. The train depot was estimated to cost about $10,ooo to build. 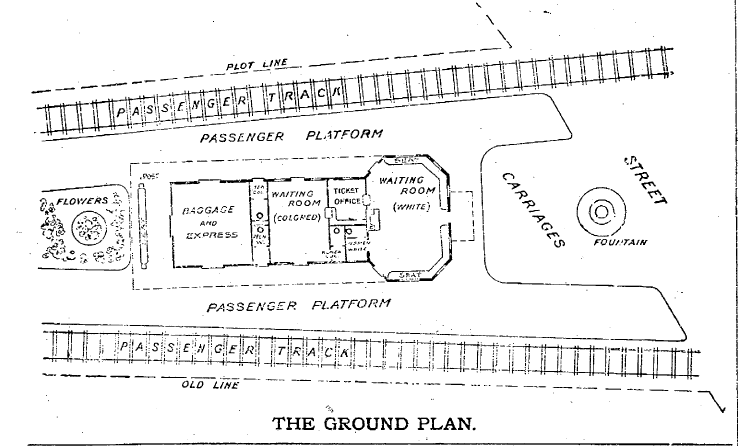 The plans for the depot, shown below, include two waiting rooms – one for whites, one for blacks. The white waiting room was planned to be about 22 feet by 14 feet. The black waiting room was planned to be about 15 feet by 11 feet. The plans for the depot were drawn by Mr. Bradford L. Gilbert. Found this ad from jeweler Kleber Denmark in the 9 Oct 1905 issue of the Kinston Free Press. 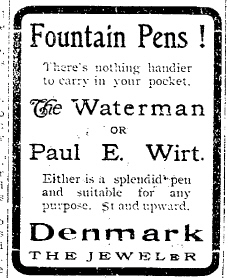 You can learn more about these pens by visiting the Paul Wirt Fountain Pens site and the Waterman websites. The work of putting in fire proof vaults for records has been completed and accepted by the board of county commissioners. Lenoir county’s public records are now protected with the best equipped steel fire proof vaults that can be had and the clerk’s and register of deeds’ offices besides being so protected from fire are from an artistic point of view very handsome and cozy quarters. The steel furniture, steel fire proof record files and steel roller shelf cabinets for the books of the offices, all painted with brass trimmings, make a well ordered setting to the newly painted ceiling and whitewashed walls. Thirteen inches of brick and cement have been added to the walls, Cortright steel roofing on steel beams with 12 inches of concrete and cement on top of it furnishes the overhead protection and steel fire proof doors with combination locks make of the rooms absolutely fire proof storage for the public records of the county. The contractor for the work was let to B.F. SMITH Fire Proof Construction Co., of Washington, D.C., and the work has been under the supervision of Capt. Price FURPLESS, a genial North Carolinian, of Southport, whose experience in such work is attested by the success with which he managed this contract. The work was approved and highly recommended by the board of commissioners and general satisfaction is exdressed by the officers at the court house. Capt. FURPLESS has been in the city about two months and he and Mrs. FURPLESS have gained a number of friends by their pleasant manner. He will leave for Trenton tomorrow, where he goes to superintend the building of a three-room fire proof record vault for Jones county, his company having succeeded in getting the contract over the bids of a number of competitors. 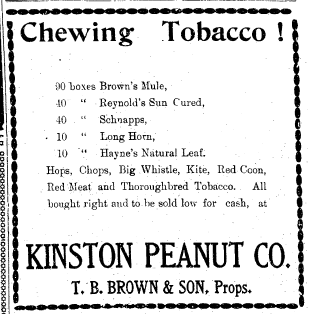 Advertisement of the Kinston Peanut Company from the October 7, 1905 issue of the Kinston Free Press. Proprietors are T.B. Brown & Son. Mr. John F. WOOTEN quietly passed away this afternoon at 2:10 o’clock at his late residence on east King street. The immediate cause of his death was apoplexy. Mr. Wooten suffered a slight stroke yesterday afternoon while in conversation with some friends at his home and recovered sufficiently to get about the house today and was sitting up just a few minutes before his death this afternoon. He had a second stroke and asked to be helped to the lounge in the room and died in a few minutes. Mr. Wooten was born November 22, 1821, and consequently had he lived until the 22nd of this month would have been 82 years old. He leaves a widow and six children: Mrs. W.O. MOSELEY, Messrs. T.C., Dal. F., J.F.Jr., and Lloyd, of this city and B.B. of Ft. Barnwell. He was also the father of the late Sheriff John C. WOOTEN. His has been a long and useful career. Since receiving his license to practice law, up until a few years ago when he retired from the active duties of his profession on account of his age, he has been a public figure in this county. Ranking among the first in the State as a criminal lawyer he wielded an influence that was not surpassed, in the days of his active practice at the bar. He was indeed a foreman worthy of the best steed of an adversary and was counted the foremost advocate of the bar in this county during his long practice in the courts in this district. The funeral had not been arranged when the paper went to press today, as members of the family were not here and until communication be gotten with them the arrangements will not be made. Hon. John F. WOOTEN was born in Craven county, N.C., about 25 miles from Newbern, Nov. 22, 1821. His father was “Council WOOTEN, of Pitt” county, a member of a large family of that name in Eastern Carolina. His mother was Grizzy MURPHY, of Irish descent, and was a near kinswoman of Judge Archibald D. MURPHY, of legal fame in this State. He received his early training in the celebrated school in Pittsboro, N.C., conducted by J.M. LOVEJOY. At the age of 21 he entered William and Mary College, Va., and in 1843 entered the Virginia University, taking the law course there. He was licensed by the supreme court in 1845 and immediately located in Kinston, and was the first and only resident lawyer for a time. He married Miss Mary Adams CHRISTIAN, of West Point, Va., a lady of great accomplishments and of a distinguished family. He was married again, this time to Miss Mary PUGH, of Clinton, Sampson county. He held the position of clerk and master of the court of equity for Lenoir county for five years, and afterwards held the office of county solicitor for Lenoir and Jones for a number of years. He was elected as a Tilden elector in 1876, running ahead of his ticket in the State. In 1879-1880 he was judge of the special criminal courts for Lenoir county. He was considered one of the best criminal lawyers in the State in his best days, and was a wonderfully eloquent and able advocate. He retired from the active practice several years ago to live out his declining years surrounded by his family and to enjoy the fruits of a well spent life. This blog is dedicated to the Kinston Free Press newspaper, so imagine my delight when I came across this biographical information on one of the founders. year later he became sole editor and owner of that paper. doubtful if any young man in North Carolina at Mr.
granddaughter of Go~. Jonathan Worth . Collegiate Institute, At the age of eighteen he was local editor and part owner of the Wilson’ Advance. A year later he became sole editor and owner of that paper. In 1882, in company with his brother he commenced the publication of the Kinston Free Press, He read law under Hon. John Manning at the University in 1885, and obtained his license the same year. The day after receiving his license to practice he succeeded Capt. Randolph A. Shotwell, as editor of the Raleigh Stale Ohronicle. He has increased the circulation of this paper and has made it a potent power for Democracy. The paper is rapidly increasing in patronage and reputation. It is doubtful if any young man in North Carolina at Mr. Daniel’s age has ever wielded a greater influence in journalism. He was married May 2d, 1888, to Miss Addie Bagley, of Raleigh, daughter of the late Maj. W. H. Bagley, who was for a long time Clerk of the Supreme Court, and granddaughter of Gov. Jonathan Worth . At Kinston, Lenoir co., N.C., John Gatlin, Esq. in the 70th year of his age. The deceased was for many years an active and enterprising merchant of that place. In the various relations of husband, father, and citizen, his conduct was always truly deserving, and highly exemplary. His health had been gradually declining for two or three years past. The melancholy death of this elder son, Dr. Gatlin, who fell a victim to the savage ferocity of the Indians, with the unfortunate Major Dade and his companions, during the last winger, seemed to greatly accerlerate his death.